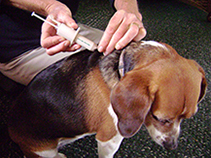 Re-usable device that makes pet subcutaneous injections easy. Simply place a loaded syringe in the Inject-Ease, place the tip against the skin, and press the button to automatically deliver the needle through the skin. You control the rate at which the medicine is injected.